In common usage, when people say they have had a cartilage taken out of the knee, this is what they are referring to. There are two rubber washers in the knee and they are shaped like the letter C. There is one on the inner (medial) half of the knee and one on the outer (lateral) half of the knee. They are on the outer edges of the joint. They are thick on the outer edge and thin towards the middle, which gives them a triangular shape in cross section. 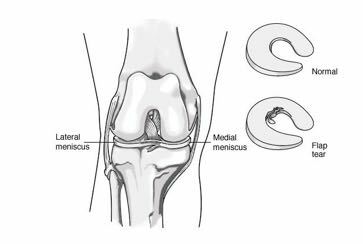 The meniscus is made of elastic cartilage and has a consistency very similar to rubber. Just like rubber, they can perish over time and get splits in them. A torn cartilage can be a result of injury, or the result of this natural process of degeneration of the rubber. Often, it is a combination of these two factors. There is a genetic element to this process. Unfortunately, some of us inherit rubber which is not particularly durable, and perishes at an early age. Once the meniscus is torn, in general it does not have the capacity to heal. There is no blood supply, except at the outer edge of the meniscus. Only tearing of the outer edge can heal and only tears in this location are suitable for repair. Often cartilage tears require removal. Articular cartilage is the smooth surface lining to all joints. It is remarkably similar to the layer of teflon on a non stick frying pan. It is approximately 2 to 3mm thick, just like a layer of teflon. 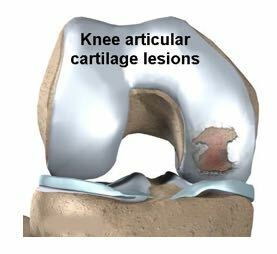 Articular cartilage can be damaged by injury or by wear and tear and takes on an appearance not unlike the surface of an old teflon frying pan. This wear and tear process occurs in all joints. When it becomes severe it is called osteo-arthritis. The body does not have any ability to regrow normal articular cartilage. In the same way that we are unable to regrow new brain cells or liver cells, once articular cartilage is lost it cannot regrow. The body can repair defects in the articular cartilage with a substitute (fibrocartilage), but it does not function as well as the normal coating, and is not as durable.